One of the most important parts of a hike but approached in a ridiculous number of ways is what to eat on the trail. Some people choose to buy their food as they go. This is the easier way to do it, much less planning time and anxiety pre-trip. But then you are subject to the crappy stores along the trail, the gas stations and convenience stores, eating boxed mac and cheese with mixed in Slim Jims every night. Since food is very important to both of us, we decided that we would mail most of our food to resupply points along the trail and then fill in the gaps in town. The number one concern of most hikers on the trail is getting enough calories. It’s basically impossible to gain weight while hiking. Hiking 20 miles a day, you will burn A LOT of calories. 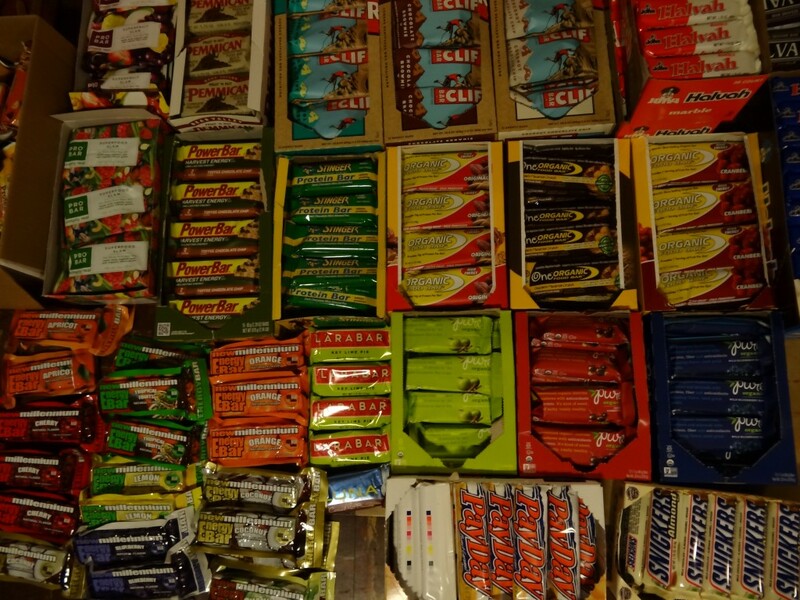 Depending on who you ask, thru hikers need about 3,500-5,000 calories a day. That’s a lot of calories. Not getting enough calories will result in rapid weight loss, lack of energy, and illness. That said, we can’t load our packs with 40 lbs. of food every week. So we evaluated every potential food item by calculating its calories per ounce. For instance, Clif Bars, a popular camping choice, have only 95-100 calories per ounce. Snickers, a popular choice for thru hikers, have 148 calories per ounce, and Halva bars (Halva is a confection from the Middle-East made with sesame) boast a crazy 194 calories per ounce. We bought a lot of Halva bars. It took a few weeks to create and test all the recipes. It was a delicious undertaking. 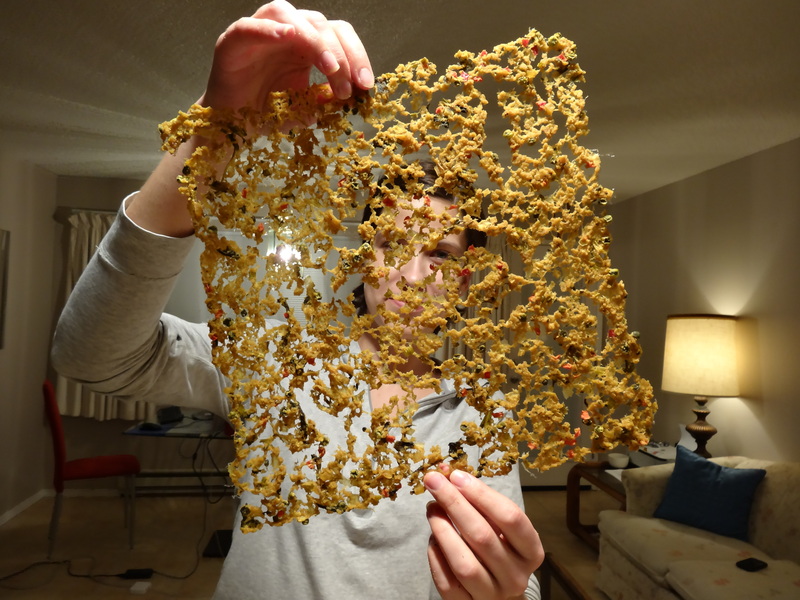 You can dehydrate a surprising variety of foods. 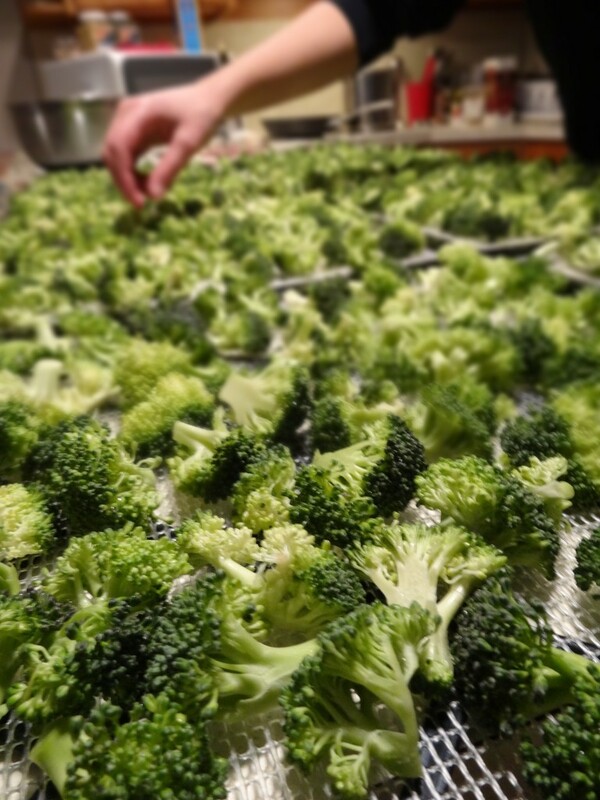 We would pre-cook the entire meal and then stick it in the dehydrator for up to 16 hours. 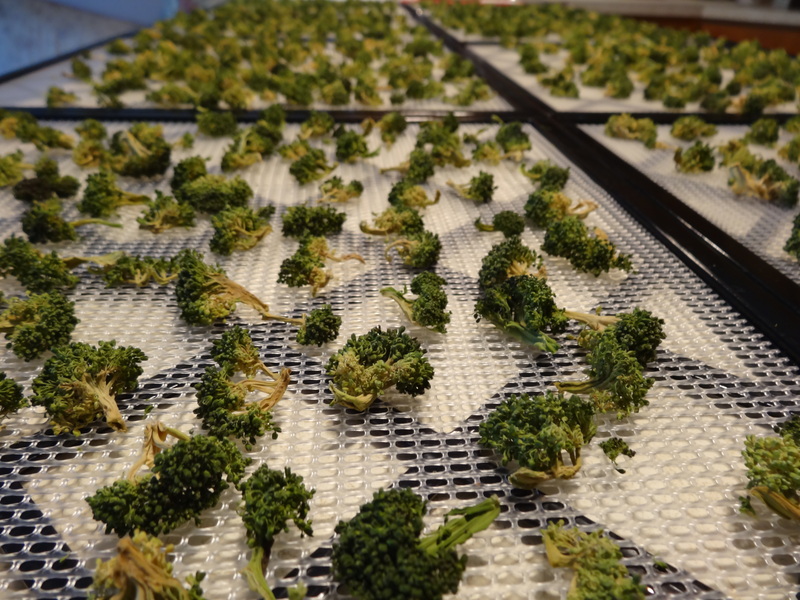 To fully dehydrate, everything has to be cut up pretty small. 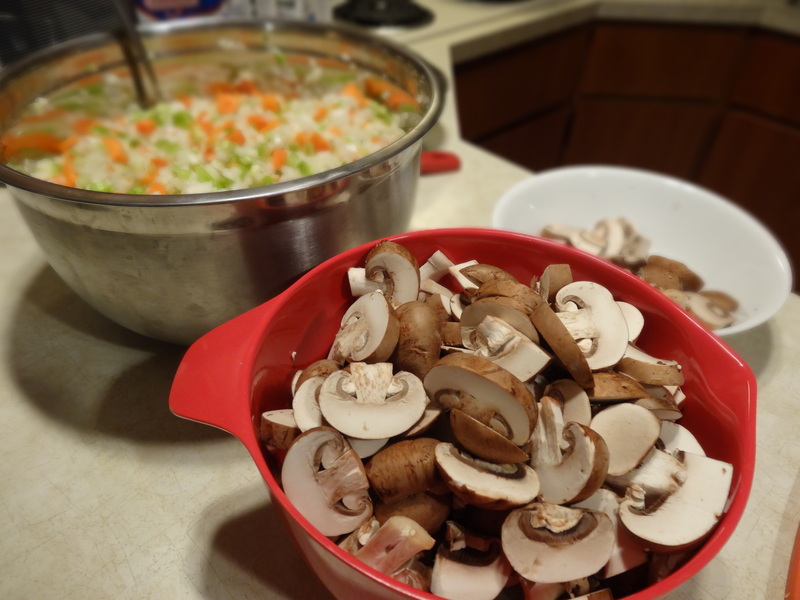 For some meals I would dehydrate the finished product like the stew, all at once. For other meals, we would dehydrate the veggies separately. 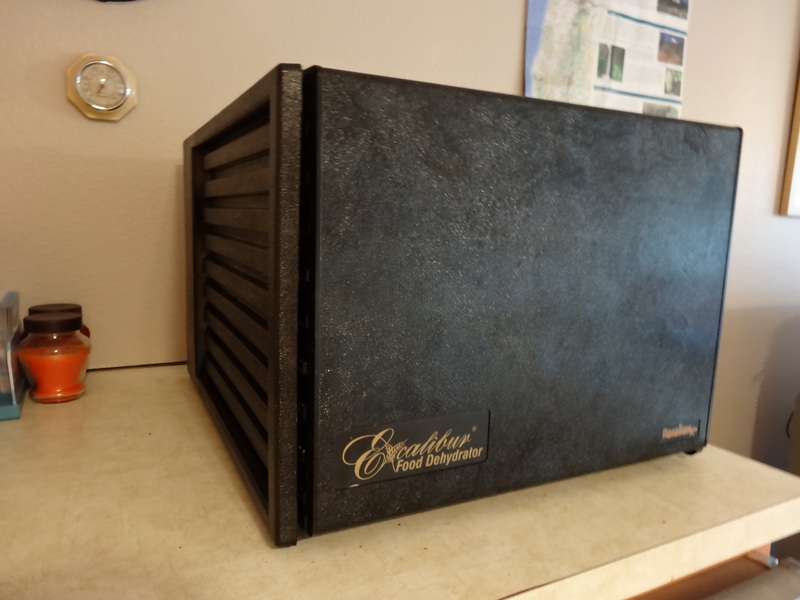 Unfortunately, you can’t dehydrate fats. So we’ll be eating lean meats only – extra lean ground beef, chicken, and turkey. We tried a pork sausage in one test of the jambalaya but it came out too chewy. I also found a multitude of different powdered ingredients I used to make sauce packets of my own. 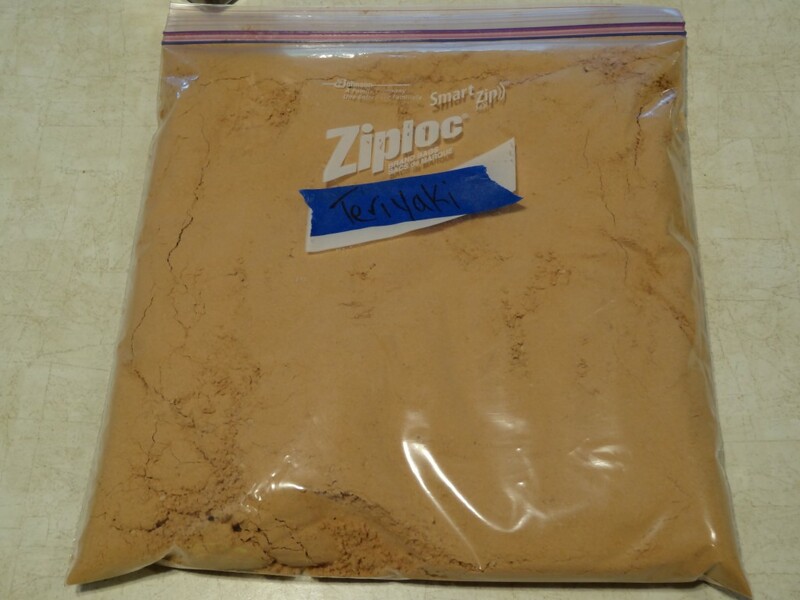 I ordered organic powdered cheese, for instance, mixed it with nutritional yeast, paprika, onion powder, garlic powder, cayenne, mustard powder, powdered milk, cornstarch, salt and pepper and voila: Cheese Sauce Mix. It took a lot of testing. I also did this with the Teriyaki Sauce Mix (Powdered Soy Sauce – who knew?). For the Pesto Sauce Mix, I combined Walnuts, Pecorino Romano, Basil, Cilantro, Parsley, Garlic, and salt, everything but the olive oil, blended it, dehydrated it, and processed it into a powder. We will be carrying a small bottle of olive oil on us at all times to add to our meals (lots of calories/deliciousness). Every meal then had to be portioned into individual servings and vacuum sealed to prevent spoilage. 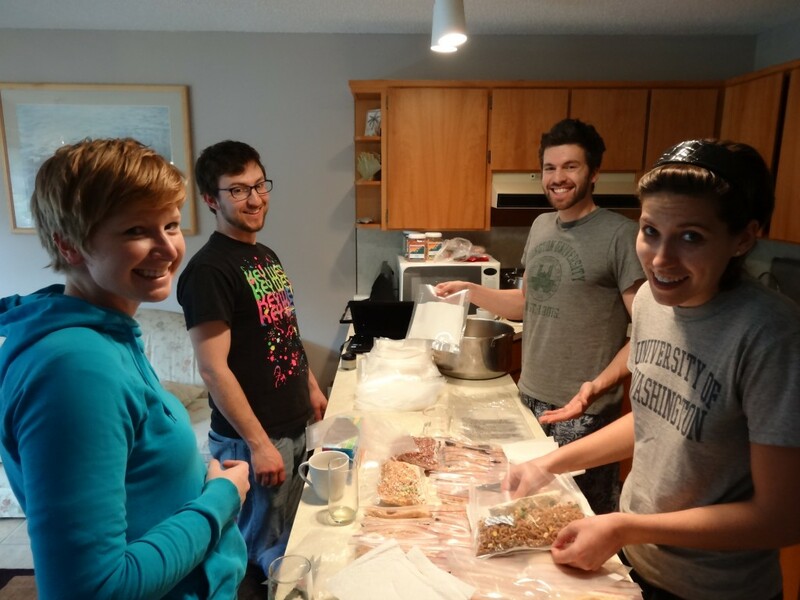 We quickly learned that many of our dehydrated meals were too sharp around the edges and would puncture their vacuum sealed packaging. We ended up having to cut paper towels into custom-sized liners for the Food Saver bags. Luckily, we have amazing friends who were up to the task. When packaging, get help from friends! They say it’s the most important meal of the day. We decided that we don’t want to boil water every day for breakfast. It takes up time and requires that you carry more fuel (read: weight). So we’re going with a combination of 2/3 cold breakfast and 1/3 hot. For the hot meal, we bought instant oatmeal from Nature’s Path. For our cold meals, we are taking a large variety of high calorie-to-ounce granolas and cereals and whole powdered milk. We also bought some freeze dried strawberries, raspberries, and mango as well as dried fruit to put in our oatmeal/granola/cereal. Yum! 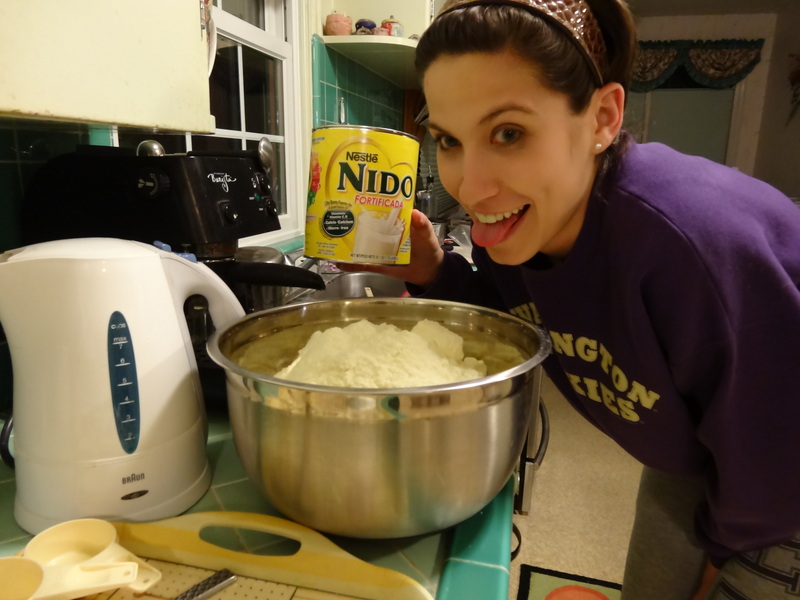 Massive quantities of powdered milk! To supplement our breakfasts, we will drink Carnation Instant Breakfasts everyday (5 flavors – 3 of which are some variation of chocolate) and Nature’s Path Toaster Pastries (basically a Pop-Tart, without all the crap in it). With bars, our goal was to get half “healthy” and half candy bars. I tried to get as close to 120 calories per ounce as possible and bought a large variety so that we won’t get sick of eating the same granola bar over and over again. 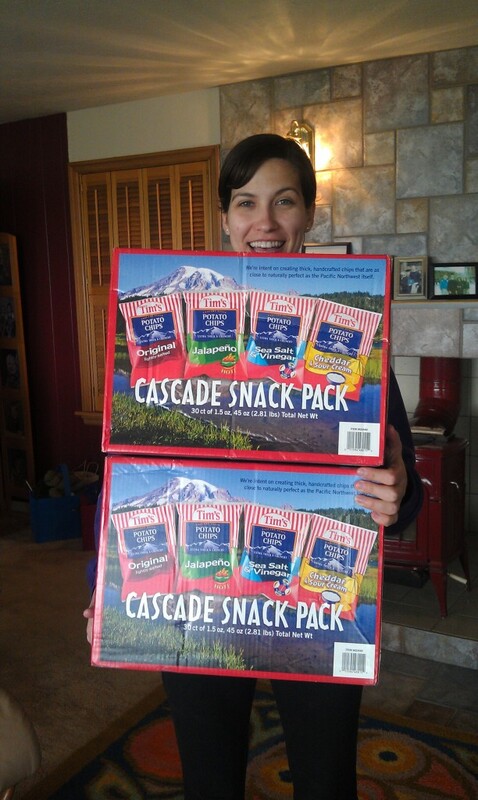 Trail mix was purchased in a grand fashion. At the local Winco Foods, there is a bulk food section where they have 16 or 17 different types of trail mix. 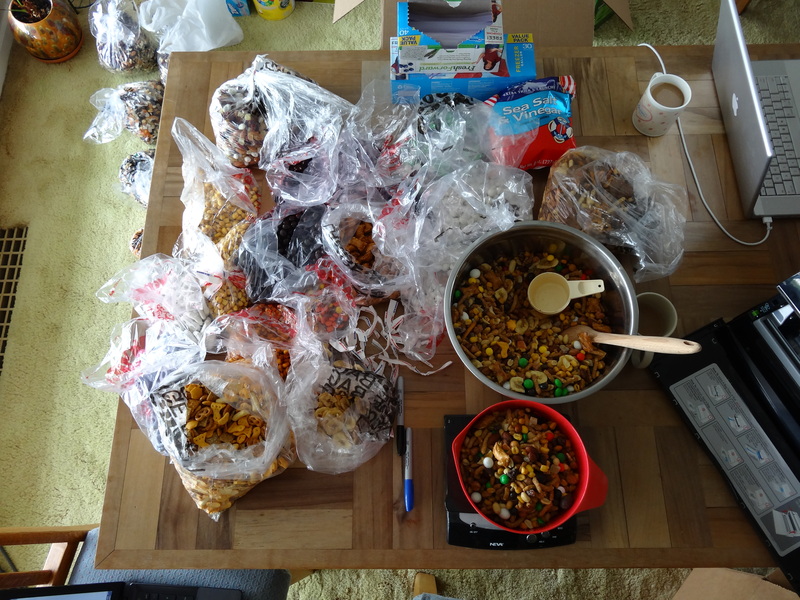 So we gathered about 4.5 lbs each of 15 different types of mix, as well as a variety of bulk items to mix into the trail mix, like Reese’s Pieces, dark chocolate covered coffee beans, yogurt covered raisins, almonds, and pretzels, etc. Bottom line: lots and lots of variety (do you sense a theme?) and a total of 75 lbs of trail mix. We mixed and matched them together, portioned, and vacuum sealed them all. As for lunch and some of the non-bar snacks, we are planning to buy most of it in towns as we go – bagels with peanut butter, salami and cheese, fresh fruit and veggies (at least the first day out of town), tortillas filled with whatever. I dehydrated 3 types of bean purees to be rehydrated cold that could be eaten with anything for lunch. Looking at all the food we have in boxes it seems like a lot. Like a crazy amount to eat a day. But it’s hard to know how ravenous we are going to get on the trail. People say you will be surprised at the amount of food you will eat. I feel like we have a very solid meal plan. Mark! You guys are amazing! I hope you all have a wonderful experience and stay safe. Oh! And you are a Chef in the purest sense of the word in addition to being a very professional cook. The food section on this blog is awesome! Wow. This is seriously amazing. Even with you telling us about your planning, I still didn’t realize the extraordinary amount of planning and prep you went through. I COMPLETELY agree with Kristin! I knew you were doin’ it when you were doin’ it, but I canNOT believe what you were doin’! I must say, it will be interesting to see what, if anything, of those list of menu’d items you still eat, post-trail. I think there’ll need to be a blop post about THAT! We met you at the Stagecoach Trails Campground,the girls whose Pit-bull was afraid of your chrome dome. I was really happy to find your blog so we can see how your adventure is going ,I am envious, you only live once and you two are doing it right. Best of luck to you both on your journey. This sounds like a cookbook or a cookbook and ingredients supply cottage business! Very impressive! Day 167, Mile 2660.1 – Oh Canada!!! Jason on Day 167, Mile 2660.1 – Oh Canada!!! Chuck on Day 167, Mile 2660.1 – Oh Canada!!! Atlas on Day 167, Mile 2660.1 – Oh Canada!! !